He’s done it! 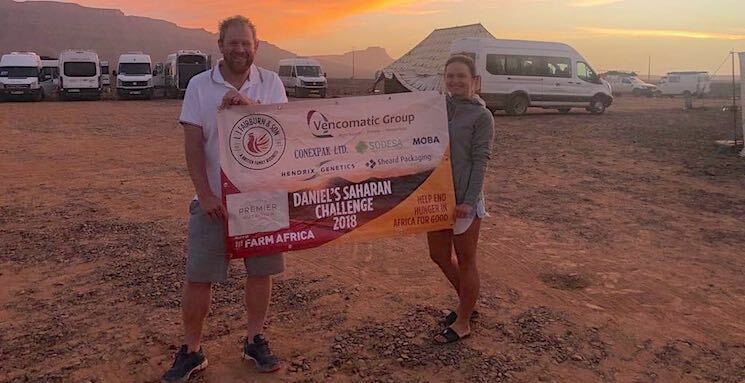 Daniel Fairburn has completed two marathons in scorching heat across the Sahara to raise much needed funds for Farm Africa. A big thank you to new gold sponsor Moba and silver sponsor Premier Nutrition. Also to sponsors Vencomatic Group, Conexpak, Sheard Packaging, Sodesa and Hendrix Genetics. If you’d like to congratulate Daniel, please support him to reach his fundraising target and help stop hunger in Africa via his fundraising page www.justgiving.com/fundraising/saharanchallenge.